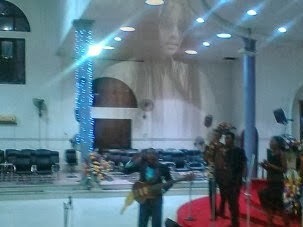 According to the story, a Lagos-based Christian band, The Perfected Praise Singers, were doing their thing at a Redeemed Church branch in Ebute-Metta, Lagos, and some people were taking pictures with their Ipads as the praise and worship went on inside the church.A young boy used his parent Ipad to take pictures too and when they got home the picture above of an Angel was among the clips they saw in the Ipad. Wow! If this is true, then you all need to be careful when next you are in church, especially during praise and worship session. You never know who could be around.